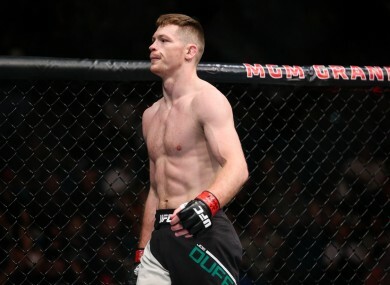 JOSEPH DUFFY ADMITS that his fighting future remains unresolved as he prepares for the final bout on the five-fight contract he signed with the UFC in January 2015. Duffy (16-2) is set to take on Reza Madadi on Saturday evening at the O2 in London. The lightweight contest will headline the preliminary portion of the UFC Fight Night 107 card (live on UFC Fight Pass from 5.30pm). The Donegal native revealed last September that he has found himself in a contract impasse with the UFC. The organisation has offered him a new deal but Duffy doesn’t feel the terms are a fair representation of his value. He’s subsequently on course to be a free agent when he wakes up on Sunday morning, so conversations with rival organisations like Bellator are inevitable. Duffy had been striving to make it to the UFC since long before he made his professional mixed martial arts debut in 2008. However, should he continue to stand firm, Saturday’s clash with Madadi is likely to end his association with the company. Duffy will be aiming for his fourth UFC win when he faces Madadi. The 29-year-old’s three victories to date have all come inside the first round. The only blemish on his ledger in the octagon was inflicted by top 10 contender Dustin Poirier via decision. Nevertheless, the UFC’s offer of a new contract doesn’t — in Duffy’s opinion — reflect his achievements. Instead of accepting what’s been put on the table, Duffy has decided to take a stand and test the waters of free agency. He knows he’s not the first fighter to go head-to-head with the UFC when it comes to contract negotiations. Bigger names than Duffy — such as Rory MacDonald and Benson Henderson — have been forced to move on after adopting a similar approach didn’t yield the desired outcome. But in an age when fighters’ marketability appears to be of more value to the UFC than their skill, the understated former boxer insists that it’s important for him to stay true to his principles. He said: “Things have to change, and I feel that if I don’t stand up and say it now then it’s never going to happen. I’ll take what I’m given and I’ll be in the same position with my next contract. You’ve just got to be true to yourself. You’ve got to do what you feel is the right thing and that’s what I’m doing. “I feel like I’ve done what was asked of me. They ask us before every fight to go out and try to steal the show. I never hold back when I go out there, I try to put on the best performance possible. Email “Joseph Duffy could be fighting in the UFC for the last time this weekend”. Feedback on “Joseph Duffy could be fighting in the UFC for the last time this weekend”.